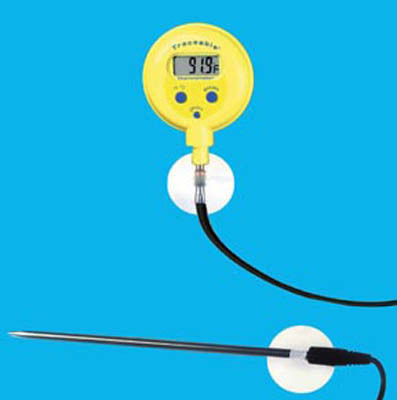 Pocket-sized, digital, waterproof thermometers! Fisherbrand Waterproof Thermometer with shockproof case helps probe and 10 ft. cable perform accurately even when both are under water. Ideal for wet areas. Range is -58 to 572°F or -50 to 300°C with a resolution of 0.1° and an accuracy of ±1°C. Case dimensions: 1 3/4 × 1/2 in.. Probe length: 5 in.